Getting an order for mastoids is rare these days. But it still happens occasionally, and when it does don’t be ashamed to pull out your Merril’s. Tissue thickness, superimposing shadows, and awkward patient positioning make the mastoid process a difficult body part to radiograph. The mastoid process is a conical shaped bony projection of the temporal bone that lies behind the ear (see the article on radiographic projections of the skull for information on imaging the temporal and other cranial bones). It is located in a position lateral to the styloid process and posterior to the external auditory meatus. It has a unique bony structure which resembles a honey comb filled with a special form of air cells. The mastoid process is almost absent or very small in the skull of newly born infants. It starts to develop after birth, as the sternomastoid muscle grows and pulls on the skull bones. The size and shape of the mastoid is rather variable and it is generally larger in males when compared to females. Stage 2: Fluid transudation or pus exudation with the mastoid air cells. Stage 3: Loss of the vascularity of the bony septa leading to bone necrosis. Stage 4: Loss of the bony septa leads to coalescence and formation of abscess cavities. Stage 5: Spread of the inflammation to contiguous local areas. Chronic mastoiditis usually occurs in conjunction with chronic suppurative middle ear infections which are usually associated with formation of cholesteatomas. Pathologically, cholesteatomas represent aggregations of flaky squamous epithelial cells that grow and encroach on adjacent bones and soft tissues altering their structures and functions. Cholesteatomas are often complicated by massive bone destruction which can lead to exposure of the dural membranes. The coexistence of acute infection can accelerate the destructive processes via the effect of the osteolytic enzymes which are secreted by the epithelial cells as a response to the inflammatory process. Mastoid ecchymosis: (Battle’s sign) fracture of the bones of the middle cranial fossa can lead to ecchymosis of the mastoid process as a result of blood extravasation along the course of the posterior auricular artery. Clinically, ecchymosis of the mastoid process is known as “Battle’s sign” and can also denote brain trauma. Mastoid injury: injury of the mastoid process is usually caused by gun shots or explosions. The extent of injuries varies greatly, from minor bone cortex damage, to mastoid perforation with extension of the injury to deep structures of the neck. Langerhans cells histiocytosis: this histiocytosis neoplastic condition is usually associated with recurrent infections, especially otitis media and mastoiditis. Are the mastoids cellular or acellular? If they are cellular, how are cells distributed and do they extend to their normal anatomical limits? If the mastoid process is acellular, is it sclerotic or diploetic? Is the cortical bone thin or thick? Are both the mastoid processes symmetrical? Asymmetry is usually the result of pathology early in life that interfered with the normal anatomical extension of the mucosa of the antrum. Are there any signs of bone destruction? Is the mastoid cavity preserved? Can the sinus plate and the dural plate be visualized in their normal positions? Is there any cholesteatoma formation? 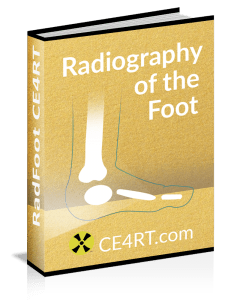 Law view: The X-ray beam is directed at a 15 degree oblique plain cephalocaudally while the skull’s sagittal plane is parallel to the X-ray film. Stenver’s view: It is also called an Axio-anterior oblique posterior view. The X-ray beam is directed at a 14 degree angle caudally and the head faces the film with slight flexion and rotation at an angle of 45 degress to the opposite side. Schuller’s view: It resembles Law’s view, except that the X-ray beam is directed at a 30 degree angle instead of 15. The angle of the X-ray beam leads to superimposition of the views of the internal acoustic meatus and the external acoustic meatus which leads to separation of the views of both mastoids. Such angulation also promotes visualization of the upper portion of the attic and the antrum via displacing the arcuate eminence downwards. Rugnstrom’s view is helpful in detection of the extent of pneumatization of both mastoids, localization of the sinus plate, tegment and the sigmoid sinus, and diagnosis of the presence of cholesteatomas. Transorbital view: (posteroanterior and anteroposterior): The X-ray beam is directed either posteroanteriorly or anteroposteriorly along the orbito-meatal line at a 90 degree angle to the film. Town’s view: It is an anteroposterior view with a 30 degree fronto-occipital axial tilt. It helps in visualization of the temporal bones of, arcuate eminence, mastoid antrum, superior semicircular canal, internal auditory meatus, cochlea and external auditory meatus. It is also valuable in the diagnosis of apical petrositis and acoustic neuroma. 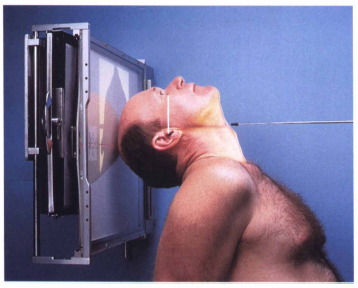 Full axial view: (Submentovertical view): The X-ray beam is directed from the submental area perpendicular to the film while the chin is raised along with hyperextension of the neck, while keeping the orbito-meatal line parallel to the X-ray film. Acute suppurative mastoiditis: The mastoid air cell system shows clouding or diffuse haziness. Destruction of the intercellular septa is also present and manifested by loss of the normal trabecular pattern. Acute inflammation of the mastoid is also associated with prominence of the lateral sinus plate. Chronic mastoiditis: This is marked by diffuse sclerotic changes of the mastoid air cell system and a prominent periantral triangle. Cholesteatoma: Cholesteatomas can only be diagnosed radiologically when the disease process leads to bone erosion, because they are radiolucent. Erosion of the antrum of the mastoid process can be visualized in the form of a translucent area within a sclerotic mastoid. A cholesteatoma cavity usually has a smooth margin. This should be differentiated from a granulation cavity which usually has a hairline appearance. Fistulas: In cases of chronic suppurative otitis media, infection usually spreads to the internal ear via the apex of the external auditory canal. This can be visualized in radiological films of the mastoid process. Zygomatic mastoiditis: This occurs when the infectious process in the mastoid process extends to the zygomatic bone, which can be visualized radiologically as extension of pneumatization into the zygomatic bone. Rarely, infection can lead to destruction of the tempro-mandibular joint. Apical petrositis: This can be seen as recognizable cell formation in the petrous bone. An operated mastoid cavity: It is usually visualized as a cavity that has an irregular margin with absence of sclerosis. CT imaging of the temporal bones is now considered the standard imaging study in the evaluation of mastoid pathology. It can diagnose up to 85-100% of cases of mastoiditis. CT films of patients with mastoiditis show opacification of the mastoid air cell system and mucosal swelling due to fluid collection. Mastoiditis also is shown on CT films by a distorted or a hazy mastoid outline with or without defects of the tegmen. Also, periosteal elevation of the mastoid process can sometimes be present in acute mastoiditis. In cases of chronic mastoiditis, CT films show evidence of osteoblastic activity. In cases of surgical mastoiditis, CT scan is better avoided to avoid unnecessary exposure to radiation prior to surgery. Although magnetic resonance imaging is not the radiographic imaging study of choice for diagnosing mastoid pathology, it can diagnose the presence of inflammatory conditions and rule out the coexistence of neoplastic pathology. On the other hand, MRI is the imaging study of choice for the evaluation of possible complications of acute otitis media such as sinus thrombosis, extension of the inflammatory process to the brain and abscess formation.